Concerns have been raised about hygiene and animal welfare at a new cat cafe in Leicester. Cats, Cakes and Coffee opened on Saturday, offering animal lovers the chance to "snuggle" with 10 cats while having food and drink. Leicester City Council said it has had three reports from concerned members of the public. 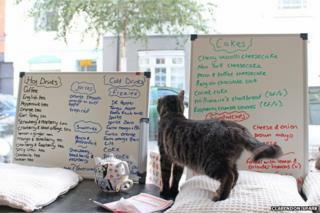 But Lisa Rivers, the cafe's owner, said her cats are all happy and the cafe is hygienic. "Regarding hygiene, the cafe is cleaned at the beginning and end of each day, plus in between each session," she said. "The cats have three sealed litter trays to choose from, which are also checked and cleaned as regularly as the rest of the cafe is cleaned." The 10 cats used to live in Ms Rivers' home before she moved them to the cafe. She said they "laze around most of the day and are very relaxed and happy" as they are used to living together. Dominic Shellard, vice chancellor of De Montfort University in Leicester, tweeted that he was "very disturbed" when he visited the cafe. He said there was an "overpowering smell of cat faeces" and the cats "looked very sad". He added that he was "worried about the cats - and you certainly wouldn't want to eat there". Ms Rivers said the food is outsourced and none is prepared on the premises, for hygiene reasons. She said Mr Shellard had been booked for a session starting at 13:00 BST but arrived an hour early, while her son was looking after the cats, then did not return. Other visitors have given positive reviews, she pointed out, including on the Clarendon Spark blog and on the cafe's Facebook page. Leicester City Council said its officers were due to carry out a routine food hygiene inspection next week. The charity Cats Protection has said it is "concerned about the welfare implications of having a number of cats in a limited space with groups of people unknown to them coming and going throughout the day"
It believes that "people who care about the wellbeing of cats would not want them to be exploited as a gimmick to sell coffee and would therefore not wish to encourage the launch of these establishments"